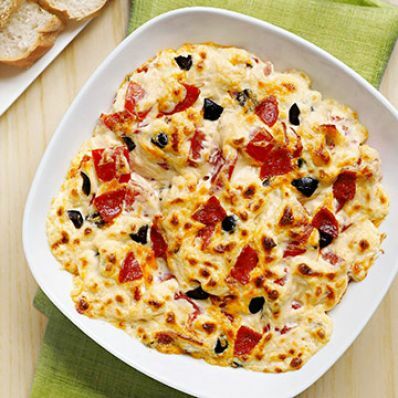 1 of 4 Heat oven to 350 degrees F.
2 of 4 In a large bowl, mix together the cream cheese, mayonnaise, mozzarella cheese, pepperoni, tomatoes and olives. Spoon into 6-cup baking dish. 3 of 4 Bake at 350 degrees F for 30 minutes, until lightly browned and bubbly. 4 of 4 Allow to cool slightly. Serve with bread pieces for dipping. Makes about 6 cups.